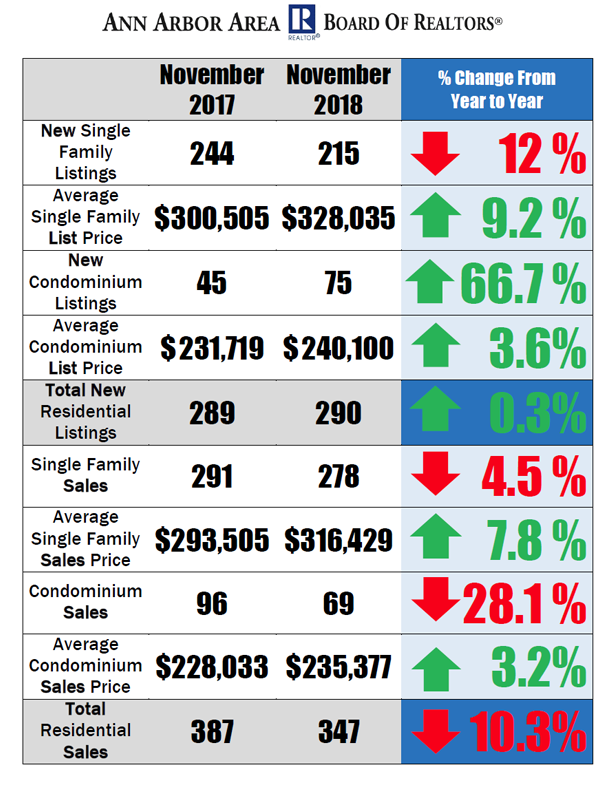 The trend in the Ann Arbor area housing market continues to be higher listing and sales prices for single family homes and condominiums, with fewer sales overall. There was a 12% decrease in the number of new single family listings for November 2018 compared to November 2017, with 4.5% fewer single family home sales compared to November 2017. Condominiums sales dropped 28.1% compared to November 2017, but there were 30 more condominium listings in November 2018 compared to November 2017, an increase of 66.7%. Average listing prices for both condominiums and single family homes rose in November 2018, with an average price of $240,100 for condominiums- a 3.6% increase- and an average price of $328,035 for single family homes-a 9.2% increase. Similarly, average sales prices for both condominiums and single family homes rose, with the average sales price for condominiums increasing by 3.2% to $235,377 and the average sales price for single family homes increasing by 7.8% to $316,429. Homes are stayed on the market a little longer in November 2018, with an average of 48 days on market for single family homes compared to 43 in November 2017 and an average of 44 days on market for condominiums compared to 30 in November 2017. To see more Ann Arbor Area housing statistics, view the November 2018 Housing Statistics Report.